Gift giving can be fun, especially if you know what the recipient likes. 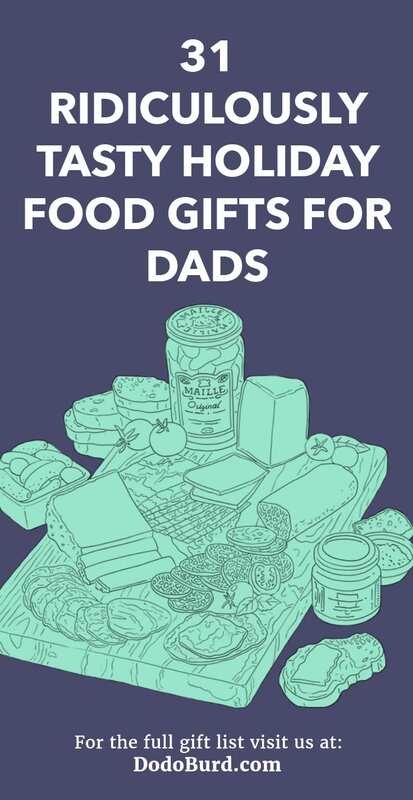 If you are shopping for your father, and he is a man that loves keeping his stomach happy, this is the list for you. On the following page you will discover a complete collection of gift ideas that are edible and exciting. If cured meats and French cheeses would make your dad happy, then boy oh boy is this gift going to make him smile. Supplied in a specially designed cooler, you will discover not only meats and cheeses, but also a range of deluxe accompaniments that will go down wonderfully. Wow, thanks to Dan the Sausageman, your dad will be able to spend his Christmas stuffing his face with more than just turkey. Containing Dan’s original sausage, Seabar smoked salmon, and other deliciously indulgent foods, the handmade wooden crate is bursting with goodness and juicy foods. Some foods are just not available in the United States of America. If you know that your father is a big lover of artisan cheeses, this could be the holiday gift for him. 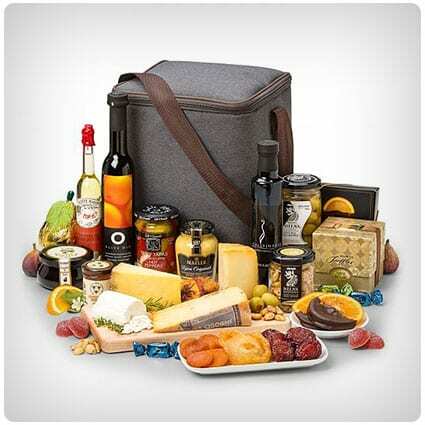 Containing a premium selection of cheeses, alongside some of the best pairings available, this delightful gift bag contains imported delicacies from around the world. Go to a bar and what do you find atop it? That’s right, nuts! Booze and nuts are a delicious combination. Perfect as a present, this gift contains Irish stout cashews, Jamaican lager peanuts, and Kentucky bourbon almonds. Snack time has never been so good. Forget peanut butter and jelly, cured meats and cheeses go together better. If you know for a fact that your pa has a discerning taste in fine foods, you should consider picking him up one of these. With a fine selection of meats and cheeses, along with crackers and a spicy spread, he will be ecstatic. Straight from the Wisconsin Cheese Company comes this cool gift box. With 4 delightful cheeses, 4 delectable sausages, and a box of crackers, the recipient will have everything that they need to sit back, relax and chow down on some of the best foods around. Arrives chilled and ready to serve. Savory nuts? Delicious. Freshly roasted in small batches and ideal as a Christmas present, this Oh! 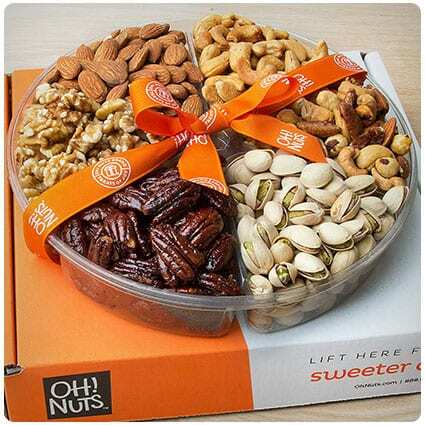 Nuts gift box offers a whopping 6 varieties per box and is brilliant for sharing. If the man that loves and raised you enjoys snacking, this kosher and vegetarian gift box could make him a happy man. On the lookout for the perfect gift basket for him? It can’t be easy, there are so many different kinds. If he is happiest when his belly is full, then this is the gift basket that he will enjoy, as it is jampacked with snacks galore that he will absolutely love. The holidays are a great time for snacks. If there is a nut lover in your life, they would want nothing more than mountains of nuts for Christmas, right? If 2 pounds worth sounds about right, this assortment of gourmet goodies is wonderfully presented and ready to gift out. The word BBQ means different thinks in different states. If you know of someone that adores the delightful taste of the country’s BBQ, you need to pick up these brilliant nuts that are designed to take their taste buds on a road trip around the southern states that are famous for their BBQ flavors. Ahh, surf & turf. If your father is a big lover of this combination of the fruits of the sea, and the land, then you need to order him one of these high quality filet feast and Maine lobster tail dinners. This complete dinner is unrivalled in quality and will make him giddy with glee. Looking to indulge your beloved papa this Christmas time? This is the perfect way. 12 ripe, juicy, and fresh strawberries have been smothered in caramel, Belgian milk chocolate and sea salt, and presented beautifully with the intention of gift giving. The combination of sweet and salty has never been better. Buffalo Bills make great jerky. If your dad goes berserky over jerky, this 6 pack cooler comes full to the brim with 12 assorted packs of awesome and exciting dried meat strips! With so many different flavors and varieties on offer, he will be chewing for weeks to come. Party dips always make a get together better, don’t they? What if the same premise was applied to nuts? Thanks to this awesome food gift, you can find out. With 3 varieties of peanuts available in classic and popular party dip flavors, the tastes are powerful and simply delightful. Nuts and dried fruits go together amazingly, and are a healthy combination. This harvest crate contains nuts, fruits, berries and more, and is a delicious gift to receive! Your father will have a great time sharing and indulging in this cool crate that will go down in gift giving history. Want the father figure in your life to receive the gift that keeps on giving? Of course you do. Choose the subscription that suits you, and your dad will have access to some of the most delicious artisan meats and cheeses available…freshly delivered to his door on a monthly basis. France…a country filled with delicious foods. Is your dad at his happiest when he has a selection of gourmet foods in front of him? Then grab him this French Connection gift box that has been lovingly filled with indulgent cheeses and delicious cured meats from the country of France. Chocolate dipped pretzels are the perfect snack at Christmas time. With 2 flavors supplied (toffee and peppermint), this tin is ideal if your pop a soft spot for chocolate. Made in Brooklyn, New York, these gourmet treats are going to make his holidays better than ever before. Who wouldn’t want to eat brownies and change lives at the same time? This Christmas, if you buy someone this selection of delightfully rich and indulgent brownies, they will in turn be helping some worthy charitable causes. World famous brownies loved by Ben & Jerry’s themselves. There are regular chocolate bars, and then there are these decadent chocolate bars. Created by an award winning chef, these delicious organic treats would be happily and gratefully received by your food loving father this crimbo. A truly special and edible experience that will (hopefully) be shared. Does your dad like the finer things in life? If he would enjoy the smells and flavors of a luxury picnic, this is the gift for him. Not only will he receive a personalized picnic blanket, but also a bottle of red wine and a complete picnic basket, bursting with delectable goods and treats. From Barnett’s Fine Biscotti comes this gift selection of gourmet biscotti. Perfect for both gift giving and sharing, the box itself comes with 24 Italian biscuits ranging across 8 unbelievable flavors. If decadence is what you are after, this box is the way to achieve it. Is your old man a manly man? If he loves the manliest meats and snacks, this gift basket is for him. Inside you will discover a range of snacks that will deliver meaty, spicy, savory, and even some sweet flavors that can be enjoyed at his leisure. Play your cards right and he may even share. Spices come from all over the world; certain countries have their own unique and exciting flavors. This selection of spicy nuts will take your dad on his own, interesting tour of 6 spicy and interesting flavors every time he sits down to have a snack….and variety is the spice of life, after all! Does he prefer chocolate to chips? Fudge to fish? Then he loves the sweet life. This gift basket is for just those people that have a weakness for sweetness and will make them extremely happy. With cookies, candies, caramels and so many other treats included, it really is a sight to see. If the words ‘sandwich cookies’ make your precious pop jump with excitement, then you already know this is the Christmas present with his name on it. Spectacularly presented for the purpose of gift giving, these awesome cookies will leave him speechless thanks to their wonderful taste. Do you want the ultimate cheese board? Then this is it. Not only will you discover gourmet cheeses, but also cured meats, wonderful honeys and even chocolates that are all delightful when enjoyed together. Arranged beautifully in a sturdy wooden crate that can be kept and reused as seen fit. Do your parents love to host? If that is the case, they need access to some delicious dips when company comes calling. If you have been searching for the perfect dips for them for Christmas, this is the way to go. Simply stir these jars into their choice of base and have a taste! Pistachios are one of the best nuts around, however, they can be quite messy. If you know of someone that absolutely adores these nuts, then this could be the gift for them these holidays. Made from solid wood, this pedestal offers a place to keep both the nuts, and the discarded shells. What do you eat instead of cured meats as a vegan? If you want the best, you eat these delightful fig ‘salami’s’. 100% vegan and absolutely delicious, these fruity yet savory treats will fill the vegan food lover in your life with joy and flavor. Have you ever eaten apple butter? If so, you will know how delicious it actually is. If you love your dad, why not make him a batch of this brilliant and truly amazing caramel apple butter that he will enjoy over the Christmas period – you will even have fun making it. Make your pa his own selection of sweet and savory compound butters to spread on his bread this Christmas morning. Presented in decorative jars, these delectable butters come in berry, honey, and garlic flavors and this DIY tutorial even comes with free printable labels so Daddy knows exactly which pot is which. Peanut butter balls are delicious…who can deny it? With the holiday season fast approaching, you should consider using this here recipe to make your very own peanut butter balls that can be shared with the family or given as a gift. Simple to make, the recipient will love them. When a father is skilled with his hands, he requires a gift that will make use of this ability and push his talents to their limits. This list is for gifted dads who need a hefty challenge before them. We’re 110% sure your pops is going to LOVE these perfect personalized gifts for Dad – take a look; there’s a huge variety, from custom aprons that have insulated bottle pockets to keep his drink ice-cold, to beautiful wooden cheese boards. 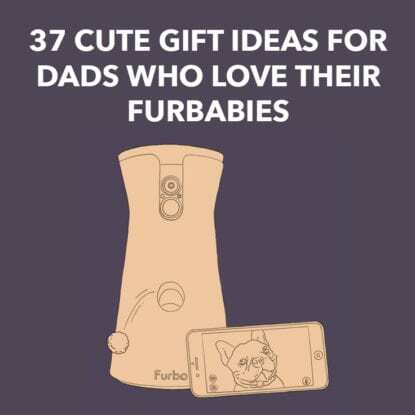 If the father figure in your life deserves a treat this Father’s Day, you should get him something from this cool list of dog gifts for dads, full to the brim with gift ideas that any dog owner would love to receive.